"Versatile, with a powerful 3 horsepower motor and simple operation with just four speeds plus a pulse button." "The modest price tag makes this affordable for just about any household and it’s also great for dorm rooms or vacation homes." "Boasts a retro beehive shape that would have looked at home in a 1950’s kitchen, but it’s built with modern needs in mind." "Two Nutri Ninja single-serve cups so you can blend your morning smoothie...and the power to knead two pounds of dough in under a minute." "Dual use blender and food processor...has seven speeds including pulse, and the blender jar holds 48 ounces." "Single-serve blender...includes two different cups (a 24-ounce and an 18-ounce) so everyone in the family can have their favorite blend." "A whopping 16 speeds to choose from...begins blending using 700 watts of power, then continues at 450 watts for smooth blending." "Five speeds...includes a whisk attachment, a chopping jar attachment with its own lid for storage, and three separate removable blades." 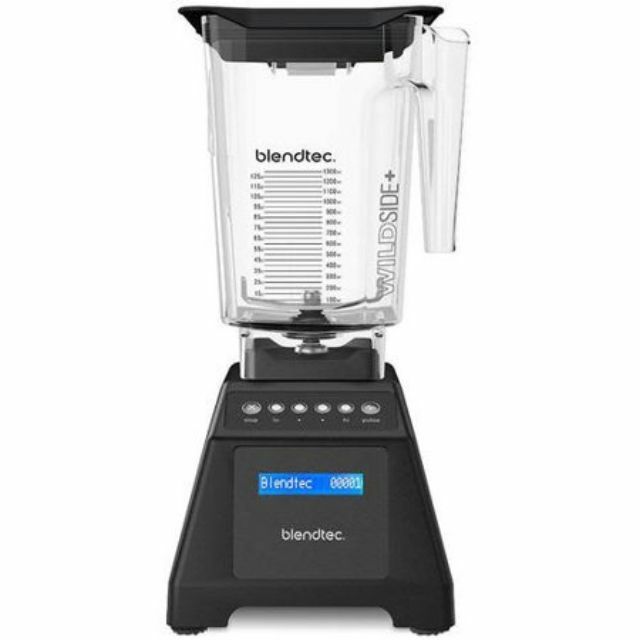 When it comes to high-powered blenders, Blendtec is one of the brands you’ll hear mentioned over and over. While it certainly can make something simple like a milkshake, it can also grind coffee, turn grains into flour, and create a silky-smooth peanut butter. When it comes to crushing ice, you’ll end up with fluffy snow (sans large bits), so you can make snow cones or cocktails with ease. The speed of this blender also allows it to heat foods through friction. This blender has a powerful 3 horsepower motor and simple operation with just four speeds plus a pulse button. The included Wildside jar looks much like a standard four-sided blender jar, but it has a small fifth side that encourages faster, smoother blending without needing to tamp down the food or stop the blender to scrape down the sides. When you need to occasionally make smoothies, milkshakes, and frosty drinks, but you don’t need extra features, this is the blender for you. The modest price tag makes this affordable for just about any household and it’s also great for dorm rooms or vacation homes. The jar is made from glass and holds 40 ounces so you can make large batches, while the wave action system helps to pull food into the blades for smoother blending. The lid has a hinged cap that makes pouring easy, and the cap fits tightly onto the blender jar so you can store your mixture right in the jar. For folks who like more control of blending, this has 12 different blending functions, including pulse. The lid, blades, and jar are all dishwasher safe for easy cleaning. When it’s time to store the blender, the cord stores neatly in the base. This heritage blender boasts a retro beehive shape that would have looked at home in a 1950’s kitchen, but it’s built with modern needs in mind. The exterior of the base is made from stainless steel that’s easy to keep clean and shiny, while the blender jar is made from shock-tested Boroclass glass that is dishwasher safe for easy cleaning. You can take it from the dishwasher and toss in ice cubes without worrying about thermal shock. Operation is simple with a toggle to select one of the two speeds. While there’s no pulse button, it’s easy to flip the blender on and off to chop foods. This has an all-metal drive, so there’s no worry about plastic gears stripping, and the initial 1000 watts of power easily blasts through ice or frozen fruits to start the blending process without jamming. The filler cap in the lid holds two ounces, so it can be used to measure ingredients and pour them into the blender. The one machine to do it all, this blender includes two Nutri Ninja single-serve cups so you can blend your morning smoothie, attach a to-go lid, and take your drink on the road. But blending isn’t all this machine does, since it includes an 8-cup food processor bowl that also fits the base, saving you valuable countertop space. The food processor has the power to knead two pounds of dough in under a minute, so you can make homemade bread without hand kneading. This blender has three speeds plus a pulse button, along with a separate button for making single servings in the to-go cups. The 1200 watt motor can power through frozen foods, vegetables, and ice with ease, and the 72-ounce blender jar allows you to make drinks for a crowd. While blenders and food processors have similar functions, they’re not identical. Blenders are much better for liquids, but food processors are often used for shredding, slicing, and chopping. With this dual use blender and food processor, you don’t have to choose one or the other, since it includes a blender jar and a food processor bowl that both work on the 500-watt base. This machine has seven speeds including pulse, and the blender jar holds 48 ounces, so you’ll be ready to blend in large batches for parties. The food processor bowl is a modest 3 cups and includes a reversible slicing/shredding disc and a chopping blade. It's easy clean, as all of the removable parts are dishwasher safe. When it’s time to store, there’s onboard cord storage so it will stay out of your way whether it’s in a cabinet or on the counter. The popularity of smoothies has made single-serve blenders much more popular, and that’s exactly what this blender was built for. There’s no need to pour from a large pitcher into a cup since the individual blender cups let you blend right in the cup. Simply attach a lid and you're ready to go! 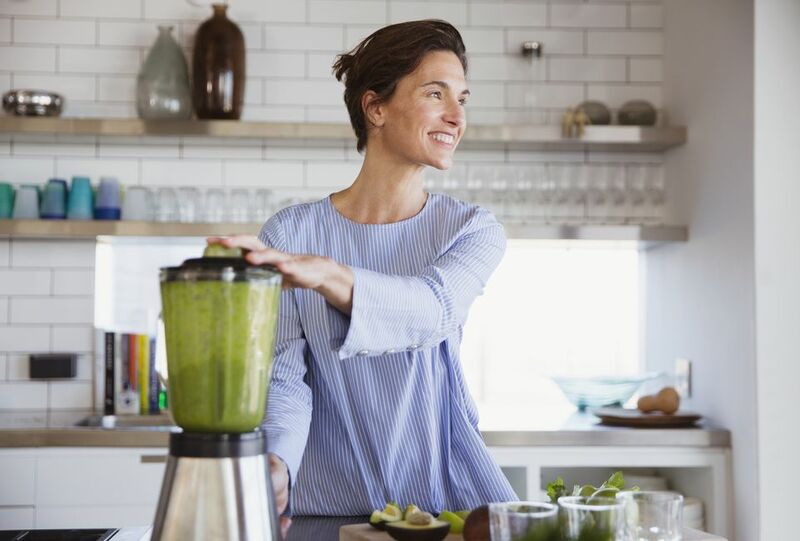 The Nutri Ninja includes two different cups (a 24-ounce and an 18-ounce) so everyone in the family can have their favorite blend and take it on the road. Additional cups are available for purchase separately. To make your morning even easier, you can refrigerate your ingredients in the jar and blend in the morning. Reviewers love that this model has intelligent blending programs that do the blending for you, or you can choose a manual setting for your personalized blending needs. Oster popularized blenders to the point where many people called them “Osterizers,” and they continue making a wide variety of blenders to fit different needs. This blender has a whopping 16 speeds to choose from, along with a pulse function. To help it get a smooth start with chunky ingredients, it begins blending using 700 watts of power, then continues at 450 watts for smooth blending. The blender jar holds 6 cups and is made from Boroclass glass that is shockproof, so you can take it out of the dishwasher and fill it with ice without worrying about thermal shock. The all-metal drive will last longer than blenders that have plastic gears, so this affordable blender is built to last. Stick blenders can do almost everything a standard blender can do, but since they’re so compact, they’re easier to store! One advantage to a stick blender is that it can blend and puree right in your saucepan or sauté pan. To make milkshakes, smoothies, dressings, or sauces, you can do the blending right in your serving cup or mug, so there’s no extra jar to wash. This machine has five speeds, so you can control the blending for the best results every time. To make this even more versatile, it includes a whisk attachment, a chopping jar attachment with its own lid for storage, and three separate removable blades for blending, mincing, and frothing.